Slimming World Diary: Weigh In .. A Little Late ..
Just got back from the gym with Gareth, and now I feel great. Always feel better after the gym, feel like I've contributed to my weight loss. Today is a great start to the week, got my superfree in and my Healthy A and B. For lunch I had left over chili with 2 slices of wholemeal bread followed by fruit. 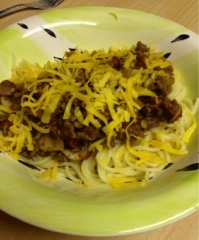 For dinner I made a favourite of Spaghetti Bolognese. Completely syn free, I had my Healthy A left so I popped a bit of grated cheese on top! Lovely! 1. Spray a pan with Fry Light and cook the onions and garlic for 2-3 mins until just softened. Stir in the mince and cook until browned. 2. Add the mushrooms and cook for 1 minute. Add the chopped tomatoes, stock and Worcestershire sauce. Season lightly and bring to the boil. Reduce the heat and simmer for about 15-20 mins until reduced and thickened. Check the seasoning. 3. Meanwhile, cook the spaghetti according to packet instructions. Drain and divide between 4 plates. Top with bolognese sauce and sprinkle with cheese if you want. So easy, syn free and filling! Also I haven't informed you of my results of this weeks weigh in. I stepped on the scales thinking of a gain and received a maintain! I'll take it, after the week I had, of alcohol, apple pie and just random snacking I'm pleased with that result. I really thought I'd blown it, I would like to keep losing every week but at this stage anything is better than a gain. So I am set for a new week, still need 7 1/2 pounds for my Christmas target. In 5 weeks, can I do it?